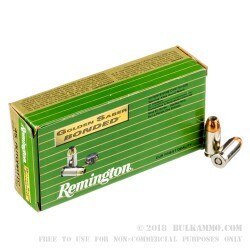 This 45 ACP cartridge from Remington’s Golden Saber Bonded line of ammunition sports a 230 grain jacketed hollow point projectile. This bullet’s lead core is hot-bonded to its brass jacket, giving it up to 97 percent weight retention even after it passes through hard barriers such as auto glass. 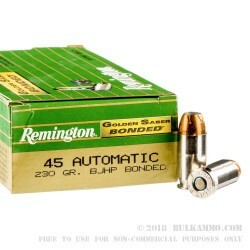 This bonding process does not cause a reduction in accuracy, either -- the jacket and core’s nearly perfect concentricity give it the gyroscopic balance needed to still deliver match-grade accuracy. 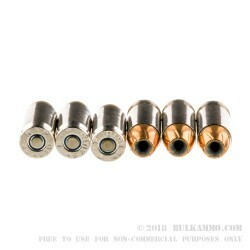 The bullet’s unique design also permits it to initiate expansion with less energy, making it a reliable choice for personal protection. This round’s brass casing features nickel plating. That makes it more visible for chamber checks in low-light environments, and also facilitates feeding and ejection in semi-automatic weapons. 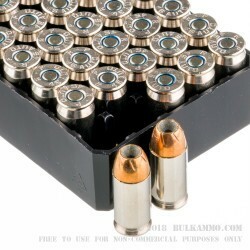 The casing is fully reloadable along with its non-corrosive Boxer primer, so you can enjoy this box of 50 rounds for quite some time.